Brogans — what are they? Posted on August 19, 2011 | Comments Off on Brogans — what are they? in the Air Force. When we were being issued our clothing, the pile included two sets of brogans. Trivia note: The dress shoes worn with our blue formal uniform were called low quarters. The military used funny words. the ankle. In Iowa, we called this a boot. Go figure. every day. On Sunday, wear pair one, Monday switch to pair two, and so on. uses. The bad news for us was that we had two pair of shoes to polish. military solved that by having us cut notch in the heels of one pair. Comments Off on Brogans — what are they? 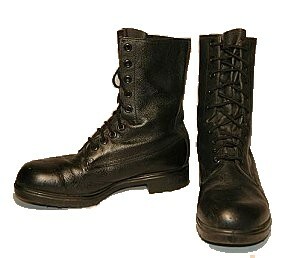 Tagged Air Force brogan, brogan vs. boot, brogans, combat boots, jungle boots, low quarter shoes, low quarters lowquarters, Thailand, U.S.A.F boots, Vietnam jungle boots, what is a brogan? Loveland has lots of good places to walk. I mostly walk a couple of different routine in my neighborhood. 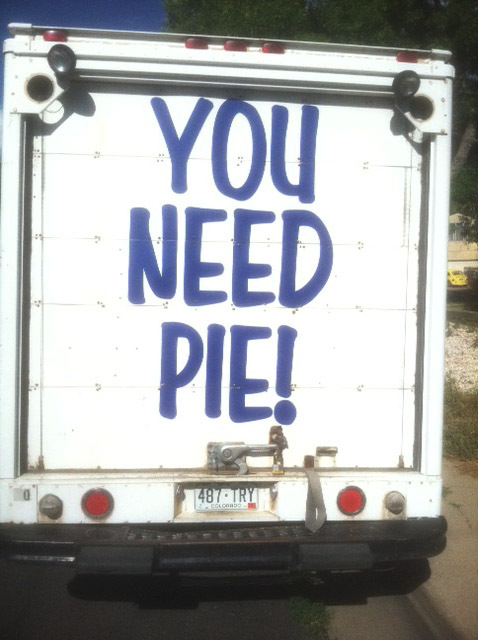 A couple of days ago, when I was out for my morning stroll, I came upon a parked truck with a sign on the back that said (in very large letters), YOU NEED PIE! Even at 9-something in the morning, that it difficult to argue with. The truck was from a bakery shop in Estes Park. I didn’t try to raise the sliding door on the back to see if there were any pies inside. I took a picture of it with my camera phone, and I was just going to post it on Facebook. Then I got thinking about the slogan, and its marketing value. It does get your attention. In another blog I write on fun with words, I posted one some time ago about another truck. Ironically, this was a bakery truck too. It was for the Aspen Bakerry (located in Denver) and it said WHERE YOUR ASPEN? See my prior post on Where’s Your Aspen. Unfortunately, traveling at 75 (or more) m.p.h., I did not get a picture of it. Why do I bring this up? Well, all the pie truck said was YOU NEED PIE. If I was following it down the road, I would have no idea where the business was, or how I could purchase a pie from them. It would have been nice to have the name of the company or a website listed on the back too. Since I was walking, I was able to discern the location of the business. But for a few more drops of paint, more people would have known. They may not be able to drive beside, or walk by the truck as I did. Why is this on my mind? I’m really not sure. Maybe it is the hot weather that gets me thinking how thankful I am that I don’t have to wear a necktie to work. This was not the case a few years ago. When I was on the faculty at College America in Fort Collins, I had to wear a necktie all four days of the week that I taught. Some days this was from 8 in the morning until after 10 at night. Boy, am I glad the “uniform of the day” for me now is shorts and a polo shirt. Anyway, back to the difference between a cravat and an ascot. 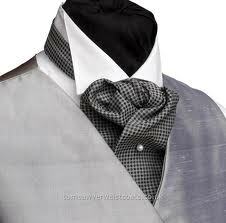 The cravat is usually a wide, straight piece of material. It is commonly work loosely tied with the neck of the shirt of the wearer being open or not fully buttoned. It is tied in a slip knot. The ends hang vertically, and overlap. Ascots on the other hand (or neck) are defined as a necktie or scarf. It is tied, and the ends hang flatly, one across the other. Many times, a decorative pin is used to secure the ascot. 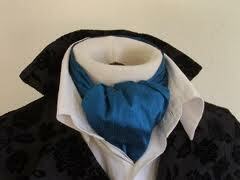 Like its cousin the cravat, it is worn with an open neck shirt, but used for more formal occasions. I have seen ascots word with tuxedos at weddings too. The ascot gets its name from the Royal Ascot Racetrack in England. something? Chances are you may or may not be using the word correctly. Note that dread is different that phobias. I did a blog post on phobias a couple of days ago. 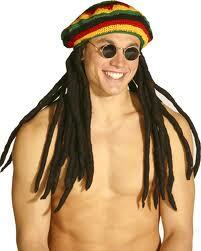 Dread is defined as terror or apprehension about something in the future. Dread is somewhat different from fear. Fear seems to be a natural reaction or instinct. On the other hand, dread is more of a self-projected fear. It in, one imagines the effects and potential possibilities of the situation. Phobias or fears were the topic of a recent blog post I did. 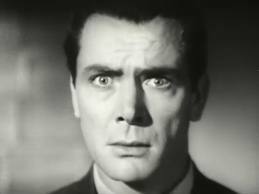 Actually, this blog entry was on odd, weird, offbeat or unbelievable phobias. In that post in www.wordsbybob.com I did not define phobia. A phone is usually an exaggerated and usually inexplicable/illogical fear of an object, class of objects or situation. Pogonophobia is the fear of beards. Did Pogo have a beard? own joke or comment here. Nephophobia is the fear of clouds. It is probably more prevalent in the Northwest United States. Lutraphobia means the fear of otters. or hippopotomonstrosesquipedaliophobia depending on which source you believe. Ironic, huh? Allodoxaphobia is the fear of opinions. I definitely know people who DO NOT suffer from this. relates to the fear of knees. It did not say whether it’s your knees or someone else’s.